My first weekend in Brooklyn was a long one, and that gave me a chance to meet up with Brownie, Lawman, Lil Bobo, and the Dewey Decimator at the DUMBO Brooklyn Flea to shop and eat. And remind me how much I love pupusas. Going to the Red Hook Field Vendors has quickly become an annual summer migration. At least one warm and sunny weekend day is earmarked for pupusas, huaraches, ceviche, and mangos, until this year. No weekend day involved visiting Red Hook, and before I knew it, summer was all but over. But there was this one last chance to eat some Salvadorean goods and I jumped at it. When I arrived only the Dewey Decimator was around and she was completely uninitiated in the ways of pupusas. "What is it?" "Like a Latin hot pocket, but not really." 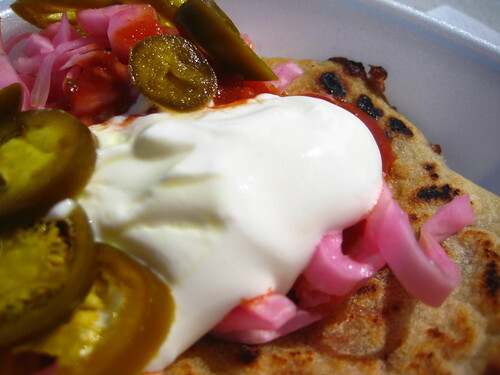 Pupusas are actually griddled cake of moistened cornmeal (masa) stuffed with filling, in our cases beans and cheese. Oh, so delicious. 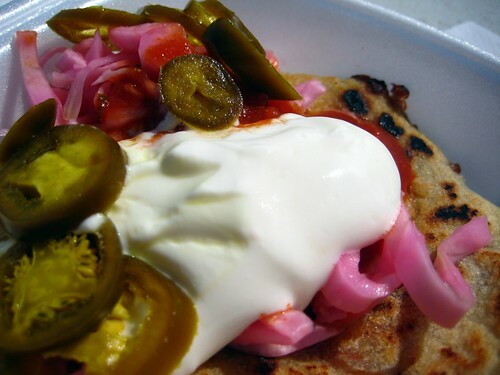 Due to my inexperience with the DUMBO Brooklyn Flea, I don't know if there are pupusas available with each market-I want to say no, but I could be wrong. Mmm pupusas are yummy. I believe they are at each flea. I had them for the first time a few weeks back at the Saturday Flea, and it was rainy and gross and they were one of the few stands out! Delicious, for sure.